The tackle of choice for all seeking extra product attention. 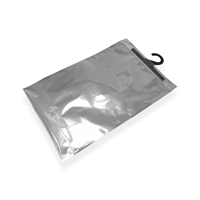 These beautiful high gloss transparent fronted Hookbags are ideal for displaying products in store. Your products will be immediately highlighted by the silver back foil, ideal for displaying things such as tee-shirts or other clothing, sports equipment, mobile phone accessories, cables or just about anything. Easy to use, simply slide your product into the Hookbag, peel off the backing of the tape and secure the flap. Hang up in store or on a market stall and hook in those customers. Grab extra attention by taking advantage of our tailor-made service, we can make to almost any size and with up to 8 colour print.